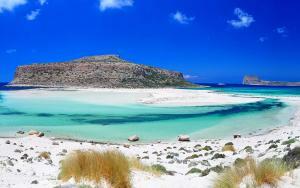 The wonderful city of Chania is undoubtedly a "must see" for anyone visiting Crete. With a rich history, picturesque views and endless opportunities to eat, shop and explore, this magical City will steal your heart. From trendy cocktail bars to traditional tavernas - and even a magnificent Venetian Harbour, Chania is awash with options for sightseeing, dining out or simply relaxing as the world goes by. This ancient covered market can be found in the centre of the Old Town and was built between 1909 and 1913 when it was finally opened by Eleftherios Venizelos. With 76 shops including a fishmongers', butchers' and chemist, this vibrant market is the go-to place for local Cretan delights including raki, honey, cheese, olives, herbs and spices! During summer months, many stalls sell a wide range of tourist souvenirs that are a cut above the usual holiday tat. Think stunning handmade bowls with intricate design, excellent wooden wares including spoons and rustic serving platters and vibrant trinkets that can brought home as exceptional gifts. The market closes on a Sunday, but is generally open on Mondays, Wednesdays and Saturdays from 8am until 2pm and then from 8am until 9pm on Tuesdays, Thursdays and Fridays. What a place! On approach to the harbour waves can be seen crashing against the old rocks (an excellent place to spot crabs with the little ones) and the vista only gets better as the magnificent lighthouse comes into view. The harbour and its surrounding area is famed for its enchanting architecture and interesting past so a must-see for anyone with an interest in Cretan history. For tourists, the seemingly endless choice of harbour side restaurants can be quite daunting as each looks as good as the next! As a tip, it's worth heading deeper into the old town where more traditional tavernas can be found at a far more reasonable price - albeit without the harbourside view. As dusk falls, expect a vibrant atmosphere and many pop up stalls along the way selling everything from fresh watermelon to jewellery, trinkets and many delights for the little ones! As one travels further into the winding cobbled streets of the old town, the atmosphere is charged with romance - especially in early evening. A pleasant stroll will take you past a multitude of shops selling plump sea sponges, beautiful jewellery and masses of olive oil, herbs and spices to take home! 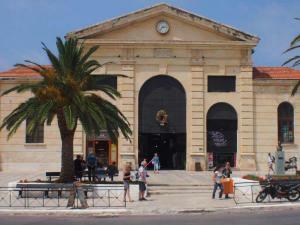 Many tavernas can be found along the way so expect to find rustic tables hidden behind colourful strands of bougainvillea and family run establishments drawing you in with boasts of "the best stifado in town!" In truth, it is very hard to find a bad meal here due to the excellent ingredients that are so widely use in Cretan tavernas. 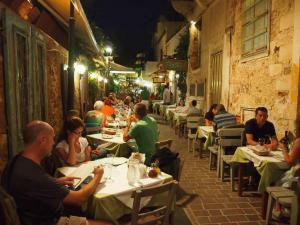 Evening meals are frequently eaten to a background of charming music as local bouzouki players meander the narrow lanes. Following your dinner, why not take a memorable trip on one of the many horse drawn carriages or treat yourself to a delicious ice cream in one of the many gelaterias. If secluded coves and picture perfect sunsets feature highly on your wish list, then a trip to one of Chania's many beaches is a must! For the young at heart, Agia Marina beach lies just 15 minutes from the centre of Chania and is a real favourite with locals. The many beach bars add a real holiday atmosphere and are particularly fun at night - when many people can be witnessed enjoying a night swim in the pleasant waters! All of our villas are situated within easy driving distance of Chania and provide a welcome retreat when returning from a day or evening trip. Without the confines of a hotel itinerary, our customers can plan their holiday according to their own priorities and enjoy the privacy of a private pool and private dining under the stars. To book your villa in Crete you only need to place a 10% deposit and with Ryanair having recently released its 2018 flight schedule to Chania, now is the ideal time to be considering your villa for next year.